The Yankees had the answer this season for Chris Sale and they finally figured out likely AL Cy Young Award winner Corey Kluber in the post-season but Dallas Keuchel remains a mystery. 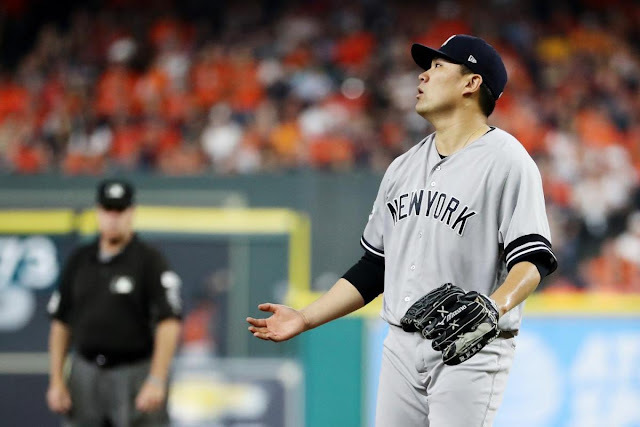 Unable to generate any runs against Keuchel, the Yankees fell to the Astros in the first game of the ALCS despite a solid outing from Masahiro Tanaka. The Yankees didn't pick up their first hit against Keuchel until Brett Gardner lined a single to left with two outs in the 3rd inning. Unfortunately, he didn't go anywhere when Aaron Judge followed with his only strikeout of the game. Starlin Castro picked up a single to left, just past the outstretched glove of running shortstop Carlos Correa, in the top of 4th inning, also with two outs, but like Gardy, he did not do anything except have a brief conversation with first baseman Yuli Gurriel. Aaron Hicks flied out to center, on huge fly that nearly took center fielder George Springer to the wall, to send Castro looking for his hat and glove to take the field. A couple more feet and the Yankees might have taken the early lead. 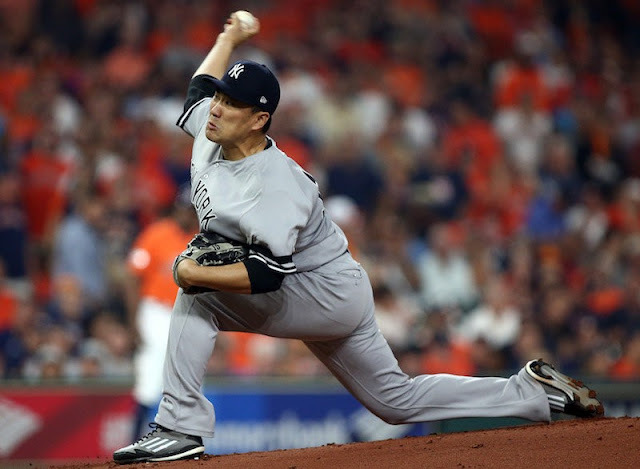 The Astros, meanwhile, didn't miss the only opportunity that Masahiro Tanaka gave them. With one out in the bottom of the 4th, Jose Altuve singled on a grounder to second, beating the throw to first. He subsequently stole second to put himself in scoring position. Carlos Correa's single to left brought the probable AL MVP around to score the game's first run. Marwin Gonzalez hit a slow grounder to second and was thrown out at first for the second out, but Correa advanced to second base. Yuli Gurriel's single to center, a grounder up the middle between Starlin Castro and Didi Gregorius, scored Correa and the Astros had a 2-0 lead. The Yankees had their chance in the top of the 5th but were unable to convert. Greg Bird led off with a single to right, a sharply hit ball just past first baseman Yuli Gurriel. Matt Holliday reached on a fielding error by Jose Altuve (bobbled the ball after stopping the grounder) so the Yankees had runners at first and second with no outs. Todd Frazier lined out to center and Brett Gardner struck out but Aaron Judge followed them with a single to left. Bird hesitated a moment and then raced around third and headed home. Unfortunately, left fielder Marwin Gonzalez threw a perfect strike in to catcher Brian McCann to nail Bird at the plate for the final out of the inning. The Yankees challenged the play but replay showed Bird was less than a second too late. 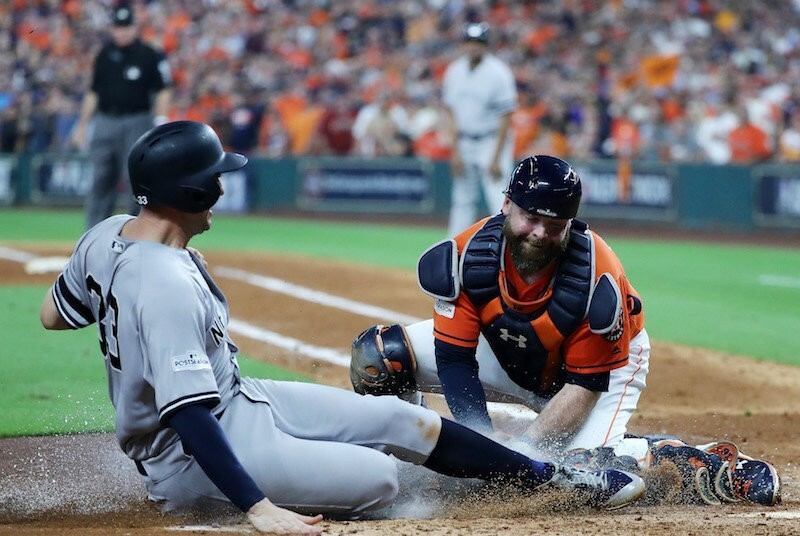 Sadly, Bird's run around third seemed like slow motion compared Jose Altuve's run in the prior inning. Credit Gonzalez and McCann for the stellar play. 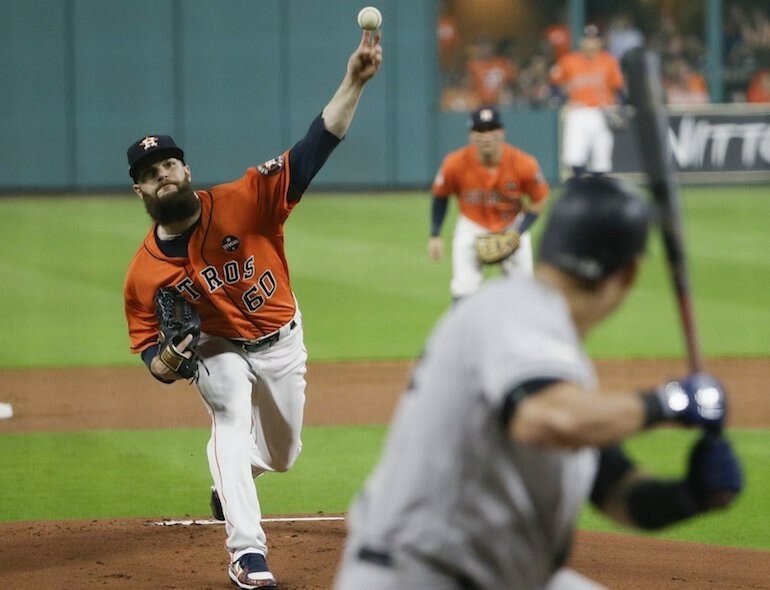 Dallas Keuchel finally left the game after seven scoreless innings (and ten strikeouts). Houston fans may love Dallas (the pitcher, not the city) but I was very glad to see him leave. But the Astros bullpen is strong and set up artist Chris Devenski has been a better version of Dellin Betances this year. Still, the Yankees had their chance in the 8th against Devenski. 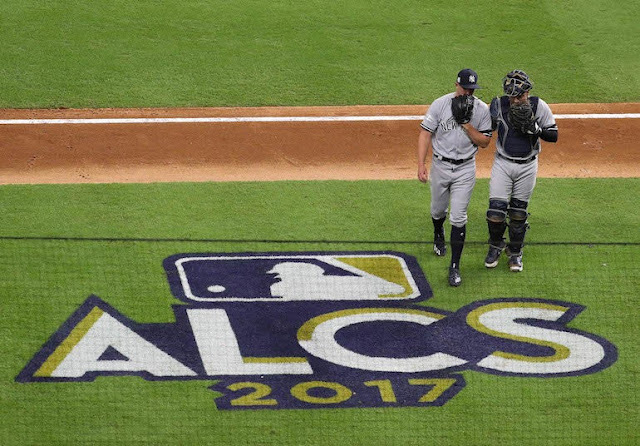 Brett Gardner worked a one-out walk, which brought Astros manager A.J. Hinch out of the dugout to replace Devenski with closer Ken Giles. Giles promptly threw a wild pitch with Aaron Judge at the plate, allowing Gardy to move to second. Judge grounded out to third for the second out, but Gary Sanchez walked to put two runners on for Didi Gregorius. The Yankees replaced Sanchez at first with pinch-runner Ronald Torreyes. Didi has come up so big for the Yankees in key spots this year but on this night, Giles won the battle when Didi swung and missed on an 0-2 count after three successive foul balls. In the top of the 9th, Giles struck out both Starlin Castro and Aaron Hicks to start the inning. 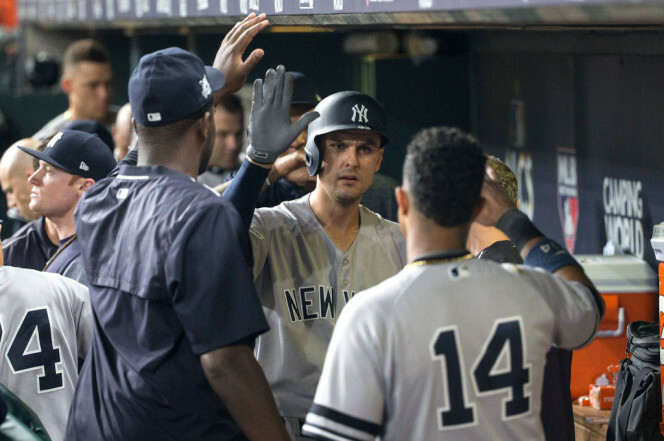 Greg Bird finally put the Yankees on the board when he homered to right, a high fly inside of the foul pole, to make it a one-run game. DH Matt Holliday was due up next, but Manager Joe Girardi opted to send Jacoby Ellsbury to the plate. Ellsbury went down swinging to end the game and hand the series advantage to the Astros. In retrospect, the huge missed opportunity was Greg Bird's out at the plate in the 5th inning. If he had gotten a good jump when Aaron Judge hit that drive to left, he might have beaten the throw. But hats off to the Astros for making their plays. The Yankees pitched a good game but the Astros pitched a little better. Fortunately, the bullpen will be rested for Game 2 as the Yankees only had to burn Chad Green in relief of Tanaka. Green pitched two frames of scoreless relief with 31 pitches thrown. On the bright side, Dallas Keuchel won't take the mound again until a potential Game 5. The Yankees offense should fare much better against crafty veteran Justin Verlander (15-8, 3.38 ERA) and the rest of the Astros starters. TGP's Daniel Burch did a great job yesterday illustrating why the Yankees should not fear Verlander for Game 2. Verlander will be tough, no doubt, but the Yankees can win this game and send the series to New York with a split. We'll have staff ace Luis Severino (14-6, 2.98 ERA) to lead the way. I like those odds. Have a great Saturday! A perfect day would feature a Yankees win! Let's make it happen. Go Yankees! Last night no outs 1st and 2nd Frazier batting runs going to be tough bunt them to 2nd and 3rd . Instead we try to hammer them home. When is the guy who made his fame as an N.L. manager going to do something Madden like. No imagination in his managing style .What better opportunity to try something un Yankkes like. Tome rto move on from the Joe and Stupid show. Great fan participation here? Like I'm taking an embalming class. Only the class is dead..........silent. The team has played very well...2/1...2/1 loses..Screw it. We will get them in NY..........Right, site commentators ? to emulate in 2018? Mateo was faster than young Simon B.
still in the break room ? Wonder what they are thinking ? Embalming 101 class member reporting for duty sir. First off I'm sick and tired of this line-up with Judge batting second. If Arod can be moved to 8th then Judge can be moved down. Second Judge isn't making adjustments at the plate. Even Stevie Wonder can see that you are going to get a heavy dose of sliders away. Why not move up on the plate a bit and try and shoot the balls down the right field line. You want to protect Sanchez at the pate put Didi batting third. I would rather see Ellsbury in the game at DH or Holliday over Headley. Ellsbury gives you the bunt factor and speed on the base should he ever reach. Girardi stays loyal and doesn't ever think with his gut. Saber metrics isn't always right. Kenny Hans...Embalmers scrambling to their keyboards ? Don't hold your breath. Some form of pathetic posting ? As for your mature comments re: Judge. I can not argue anything. I think he is at his best when "NO" stress is put upon him. None. This version of the strike-out factory is bad news. Placing him deep down below, will work. Who cares, 6-9 ? Finding a DH that can hit ?.....Now...0 for 25 something ? Jesus. The three prior failures should be bypassed...go with Ronald Torreyes. Has he not ever hit ? Stay strong, Ken. You are not an embalmer. Hansel...The Stevie Wonder line was great. Still laughing. I missed it in my above. Actually having Torreyes is not a bad idea. Never thought of him, however he does put the ball in play and is fast. I think Girardi has him buried in Fido's doghouse after that base running error against the Indians. Interesting thought. Not really sure what is going on with this offense. Judge is, and always will be a high stikeout guy. Moving him down in the lineup certainly wouldn't be a bad idea. However, he does change the way the rest of the lineup is pitched to. If the guys around him are striking out at a high rate, it's just wasting his spot. I agree on Headley sitting on the bench. I too would rather see Ellsbury or Holiday. Or how about Torreyes at third and Frazier as the DH? As far as the batting order, I would go Brett, Didi, Sanchez, Bird, Judge, Hicks, Castro, Frazier, Ellsbury. If Toe plays third, just swap him with Ellsbury. I agree with everything Levin except with Judge batting five. I would have judge in the 7 hole. One of my issues with Girardi is his failure to recognize that you don't always have to be loyal and keep the same order. I won't argue Judge in the 7th hole. Maybe go with the hot hand in the 5th spot. But one could say that you dance with the one that brought you. And we're not here without Judge. I know everything changes in the playoffs though. Something is happening, round here. The team has played well, even when failing to win. 2-1 games, and pitchers going long to make it now 2-2 !...Great ! But...where are the season long posters ? This is show time for you ! Oh, I get it.....embalming finals coming up ? Sad. Daniel must be spitting out his southern sweet tea. All those years of working, and all he has is no shows. Jesus, ISIS posts more than his crew. So be it......Yanks have had Houston's number since 0-2. Screw them. I think the Idea of moving Judge anywhere is the wrong move. If those around him make the other team pay (by hitting) then they have to pitch to him. Also, one must remember he is a new-be and hasn't learned how to read the ball (Arm angle etc.). Both he and Sanchez are slow on the uptake and don't adjust quick enough to keep-up with the game. Judge leans across the plate trying to pull a low outside pitch...can't be done! He has long arms and only needs to move his left foot forward as the pitch is seen to be on outside edge...not move closer to the plate! Right now they have been trying to pull everything all the time...well, until to night anyhow. They also need to learn the game! When one has a 1-2 count and a man on 2 or 3 base, what do we need to get runners in? Just a safe hit to the outfield, they should check-up a bit for a hit not the the big over the fence swing they always use. Sometimes a hit is as good as a HR!